Obituary – Nichols, Carolyn Coy (Kimball) « Perry High School Alumni Association, Inc.
﻿Band ’45-’49; Perryscope Staff ’48-’49; Student Council ’46-’48; Library Staff ’45-’46; Y-Teens ’46’49; Home Room Vice-President ’45-’46. Carolyn Coy Nichols, native and long-time resident of Perry, passed away peacefully at her home on April 18th, 2018. She was 86. Ms. Nichols was born on November 17th, 1931, to Theodore H. “Ted” and Gladys M. Kimball (nee Brewer), also of Perry. She resided briefly in Tulsa during World War II, while her father worked at the Douglas bomber production facility there. 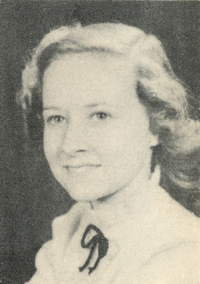 She graduated with high marks from Perry High School in 1949. Following high school, Carolyn moved to Oklahoma City where she worked for many years as a bookkeeper. Later, she would spend a few years in Japan, and also resided in Arizona and Enid, Oklahoma before returning to Perry in 1979. After her return to Perry, Ms. Nichols worked as the local bail bonds agent, followed by several years at the local Radio Shack store. She retired in 1998. In her later years, Carolyn enjoyed working on various household projects, and keeping a record of her family history. Her favorite activities were spending time with her dogs, and working in the yard, in keeping with her life-long love of nature and animals. Graveside services will be held at Grace Hill Cemetery on Saturday, April 28, 2018 at 10:00am in Perry, Oklahoma under the care of Brown-Dugger Funeral Home. Ms. Nichols was preceded in death by both of her parents. She is survived by one son, Kevin Nichols, of Washington state, and by her beloved dog, Mattie. In lieu of flowers, Carolyn’s family and friends request that donations be made in her name to the Save the Redwoods League of San Francisco, California.